I am thrilled to be apart of a fantastic group of bloggers bringing amazing chocolate recipes this week! Thus this brings the most delicious Easy Turkey Pumpkin Chocolate Chili! This is a unique combo of sweet and savory but let me assure you, this is yummo! I would like to thank all the sponsors of #Choctoberfest2017, our Gold Sponsor Imperial Sugar and also Barlean’s! Also our fabulous shout out sponsors, Rodelle and Davis Chocolate! Disclaimer: Although I was given products from the sponsors, all opinions and recipes are my own. Thank you for supporting the sponsors who keep me in the kitchen! The fam was seriously not looking forward to helping me with this one! They thought it was a bit odd! I reviewed with them, their love of Mole, which uses Mexican chocolate! We have also had some savory beef recipes that have had chocolate added and they were wonderful so why not try Easy Turkey Pumpkin Chili! I didn’t back down and truth be told, I was right, this chili is epic! The hubs cracks me up! I give him a run through of what I am experimenting on for the week. We both know he isn’t always listening so he when he says, yes all sounds great! He’s then eating tofu, chickpeas, and quinoa…. Yes, we eat everything, a few times before it is published! So It has to be a unanimous thumbs up before a recipe is posted! So again, back to the chili, my first round with the family was during game day! He asked, is this your regular chili, me – YUP! He loved it as did the rest of the crowd! Everyday Eileen tip: I tested freezing the chili and it was perfect! This would be great using leftover turkey after Thanksgiving! I always have a lot of pumpkins then too! Slow cooker friendly too! Use lean ground turkey, low-fat, low-calorie, high in protein. Pumpkin is loaded with Vitamin C, perfect to aid in keeping colds away. Fiber aids the digestive system and Pumpkin has a nice amount for the body. I love Cocoa because it aids in the reduction of high blood pressure and cholesterol. I made this delicious Easy Turkey Pumpkin Chocolate Chili quite a few times on the stove top. If making in the slow cooker, brown the turkey meat first. Add browned meat and remaining ingredients to the slow cooker, Cook about 4 hours on low, 8 hours on high. We had this again over the weekend! My son was looking to heat some up for a late night snack! Quite disappointed, there was none left! I know its a keeper, he asked can I make it again this week! Absolutely! I just love the combo of ground turkey, turkey sausage, pumpkin, and cocoa! 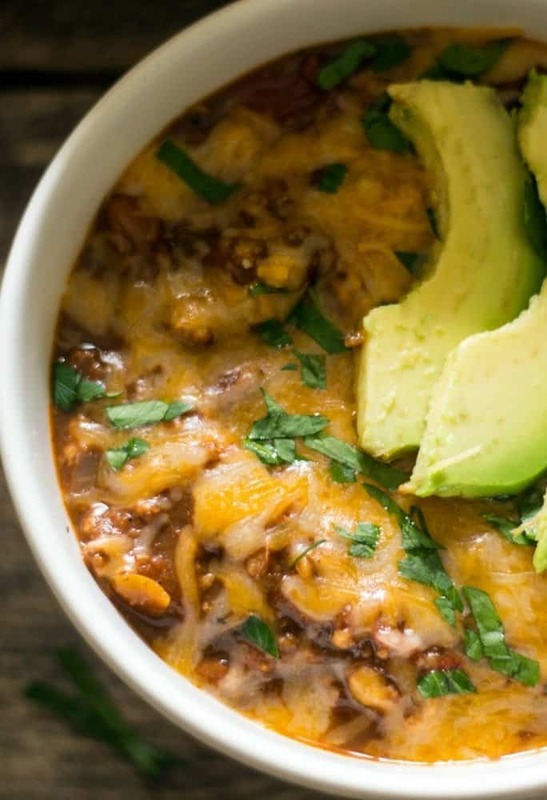 Top it off with the spices and this is one fantastic chili! This is not crazy spicy! If you want really spicy add more Chili Powder and also try Easy Chipotle Chili! The meal starts by using Barlean’s amazing butter flavored coconut oil! This is a fantastic product that is a fabulous healthier replacement to butter. This yummy Easy Turkey Pumpkin Chocolate Chili has more of a savory flavor with a sweet kick from pumpkin puree and cocoa powder! The sweetness balanced from the smoked paprika, chili powder, and cumin. The heat gets a balance from the cinnamon! Oh, just give it a go and you will not be sorry! We had one of my favorite cocktails Skinny Pineapple Mango Frozen Margarita with Chili Salt Rim! 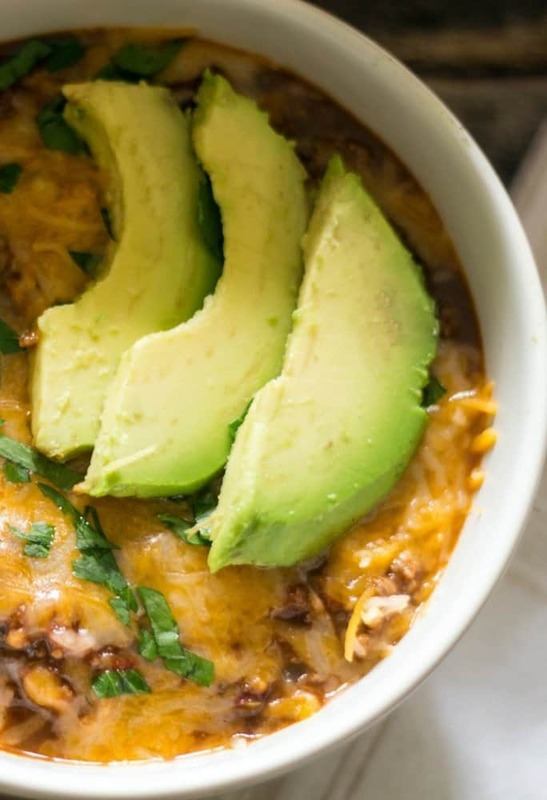 The skinny margarita pairs really well this and any chili! Okay, actually any meal! #Choctoberfest2017 began yesterday! Checkout the amazing recipes from some of my favorite blogger friends from yesterday here! Save this delicious Easy Turkey Pumpkin Chocolate Chili to your favorite Pinterest board HERE!!! Check out all the amazing recipes from these amazing bloggers participating in #Choctoberfest2017! You can follow along with their posts on Twitter, Instagram, Facebook by searching #Choctoberfest2017! 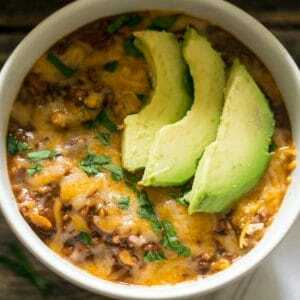 This is a savory chili filled with delicious flavor! The chili is not overly spicy and has a hint of sweetness from the cocoa and cinnamon. 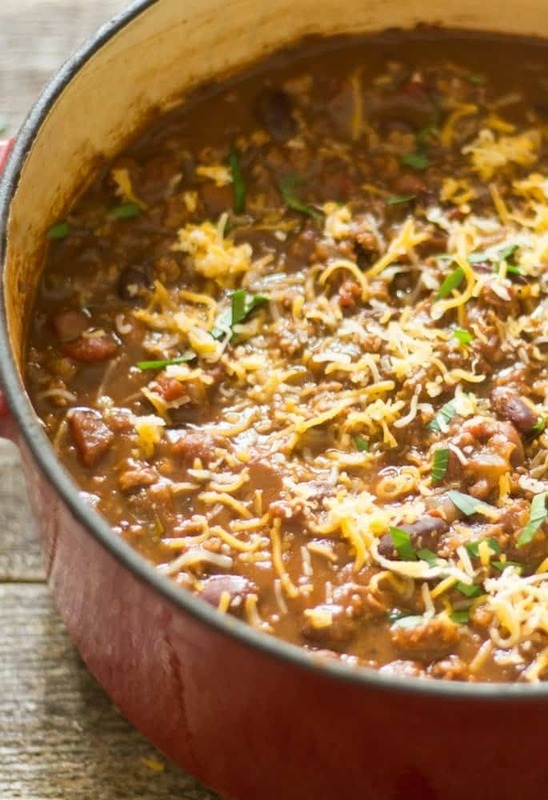 The flavors marry well into a fantastic chili with unique flavors that are always a hit with family and friends. Heat a stockpot or soup pot over medium heat. Add butter flavored coconut oil. Once melted add in the onions and pepper. Saute for about 4 minutes to soften the veggies. Add in the garlic and saute another minute. To the pot, add the ground turkey and sausage to brown. Be sure to crumble the sausage as you brown the meats. Once browned, remove any excess fat from the pot. Stir in the ale, pumpkin puree, spicy Chili beans, fire roasted diced tomatoes, chopped green chiles, tomato paste, cocoa powder, Hot Mexican chili powder, cumin, smoked paprika, dried oregano, and cinnamon. Add in salt and pepper, to taste. Reduce heat to low. Let simmer for about 1 hour. Stir occasionally. After one hour, check seasonings and adjust if needed. 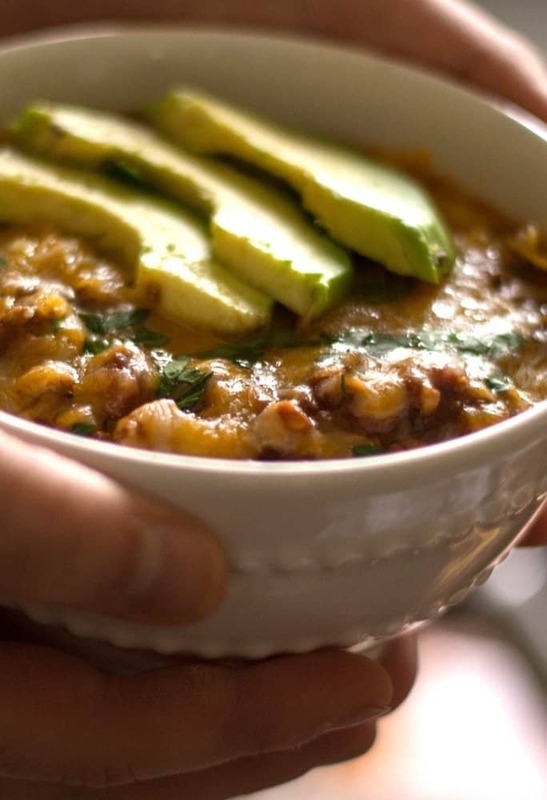 Serve with your favorite garnishments for chili avocado, sour cream, guacamole. shredded cheese, green onions, and cilantro. Can be re-heated and served later. I use a dark ale or pumpkin beer. Chicken stock or veggie stock can be used. I use Rodelle Baking Cocoa Powder, can use another cocoa powder. I love using Barlean's butter flavored coconut oil. Can use regular coconut oil, olive oil, or butter. This chili freezes well and also is awesome made ahead and reheated when ready to eat. The recipe is no where on this page. There is no link! Can u let me know where to find it! Hi Joanna, I am so sorry. My tech person was doing an update on my recipe section about an hour ago. It may have knocked out the recipe. I have added it back in. I am so very sorry for any inconvenience. Whenever I see chocolate with savory and spices, I think of mole. There are so many yummy things happening with this dish! Thank you Cheryl! One of my favorite fall meals! I love every single one of these ingredients!!! And the fact that I can freeze this chilli – ok I’m sold! Love this recipe! Looks fabulous! Yes, absolutely a freezable meal! Enjoy the chili! What a unique recipe. I’ve never tried chocolate in savory dishes, but this looks awesome! Can’t wait to try! Thanks Shadi! I hope you enjoy it! what an interesting way to use pumpkin and chocolate together! Oh my gosh, this chili looks amazing! I would have never, ever thought about putting chocolate into chili! But I am so intrigued and definitely want to try it now! Thank you so much Jenni! I hope you try it! Easy and delicious!